NYAUNG U—When his son said he was going to give up his toddy palm-climbing job, U Kye Ni, who has spent the past 30 years climbing up and down toddy palm trees, was speechless. U Kye Ni felt sorry that his son was quitting the job, which has been a way of life for him and his ancestors. However, he does not have the courage to persuade his son to continue the elbow-grease job that provides little daily income with no prospects of wealth or guarantee for his livelihood. He knows many toddy palm climber families in Nyaung U Township have quit their jobs and found new jobs that are safer and earn them more income. “I decided not to get in his way when he said he wanted to quit the job. As there is now no one to climb toddy palm trees in the next toddy season, I decided to let my toddy palm fields lie idle,” said U Kye Ni, a local of Chauk Kan Village in Mandalay’s Nyaung U Township. More and more toddy palm climbers are giving up their job in many parts of central Myanmar, including in Nyaung U near Bagan and Mandalay, Magwe and Sagaing regions. As the number of climbers has declined, the number of idle toddy palm trees has increased in central Myanmar, also known as the Dry Zone for its low rate of rainfall. Professional toddy palm tree climbers were once a feature of society in the arid zone, but they are becoming a rare sight today. “We have over 400 households in my village. But only around 100 work in toddy palm now. In some villages, there are only a few toddy palm climbers. Their number has significantly declined,” said Chauk Kan village-tract administrator U Htwe Maung. Toddy palm climbers have given up their jobs because of the harsh physical labor and risks associated with climbing the trees. It is not uncommon for the climbers to fall from trees to their deaths or have their bones broken. The work starts early in the morning. The climber climbs the tall tree via a ladder attached to its trunk and brings down the pots that have filled with toddy palm sap overnight, replacing them with empty pots. At noon, he climbs again to repeat the job. Climbing up to 50 trees, which can be as tall as 25 feet high, carrying a bunch of pots is not an easy job. While the climber struggles with the blazing sun on the tall palm trees, his wife struggles with the searing heat as she cooks some of the toddy juice in a large pan to make jaggery. Jaggery is a sugar-like sweet traditionally served after a meal to aid digestion. The process takes a whole day. Despite their hard work, selling jaggery doesn’t earn them much money as they often have to give much of the jaggery as payment to brokers who they have borrowed money from. The toddy season lasts just six months a year from January to June. When the toddy palm trees are not producing sap, the climber families have to do other odd jobs. It is during this time that they find themselves needing to borrow money from jaggery brokers. “Poor toddy palm climbers have to ask for advance payments from jaggery brokerages when they are jobless and when they need money to buy necessities for the toddy season. When they get jaggery, they give it to the broker to repay the debt. They are trapped in this circle,” said U Kye Ni. 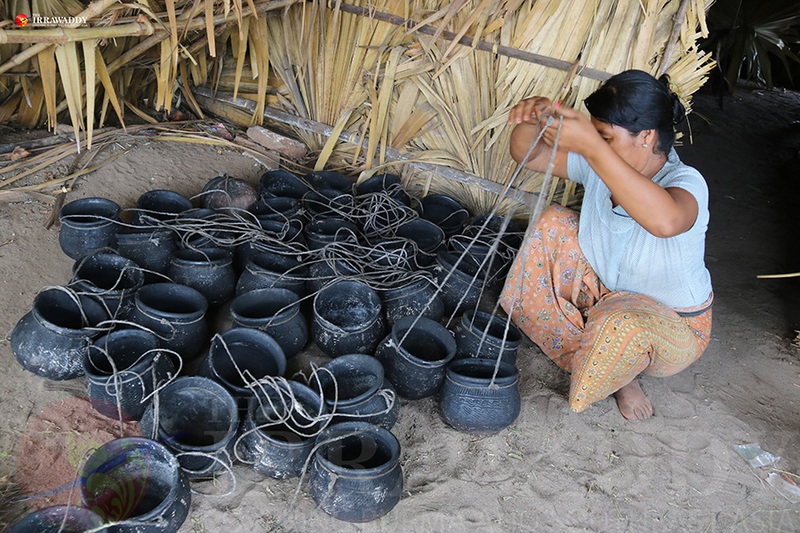 These days, a palm climber’s family can produce from 32.6 to 49 kilograms of jaggery per day. Toddy palm climbers have seen good days like when last year the price of jaggery rose to 1,000 kyats per viss (1.633 kilograms). But before that, when the price was just 500 to 600 kyats per viss, they had to live a hand-to-mouth life, only earning around 10,000 kyats a day. “Previously, we only earned around 10,000 kyats per day, even when the whole family worked to make jaggery. But if we work at hotel [construction] sites in Nyaung U, we can easily earn 20,000 kyats for three people. So people don’t climb toddy palm trees [anymore]. They do other jobs,” said U Thaung, a resident of Natpalin Village in Nyaung U Township. “My father died falling from a toddy palm tree. He died on the spot. So I don’t want my husband to work as a toddy palm tree climber. I want him to do other jobs but it is the only job he can do. I am worried whenever he climbs toddy palm trees,” said Ma Kyu Kyu Naing, who is also a resident of Natpalin. More and more youths in central Myanmar are leaving their ancestral work in search of safer and better-paid jobs in big cities like Yangon and Mandalay and neighboring countries such as Thailand and Malaysia. “None of the youths in the village work as toddy palm tree climbers now because the job is tiring and risky. I became fed up with that job and so I’m working at a hotel now,” said Ko Win Min, a resident of Kyaukpadaung Township who is working at a hotel in Nyaung U. “If we can get a decent income to support our families, of course, we would prefer this family business as all the family members can live together. But as the income is not enough, we have to do other jobs. 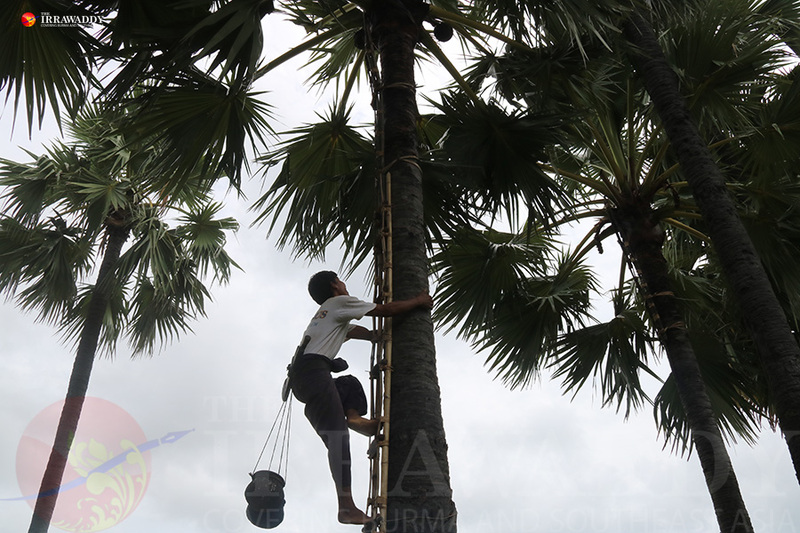 I’m very concerned that more and more toddy palm tree climbers are quitting over time, and the business will sink into obscurity,” said Natpalin villager U Thaung Myint. A new business scheme has emerged following the decline in the number of toddy palm tree climbers but it is neither sustainable nor environmentally-friendly. Owners are selling their idle toddy palm trees in Mandalay’s Kyaukpadaung Township and Magwe’s Yanangyaung, Chauk and Yesagyo townships. Businessmen buy them to make furniture and retaining walls. Environmentalists however, have touted toddy palm trees as something extremely valuable for the arid zone. As the roots of toddy palm trees are excellent at absorbing water, they play an important part in controlling high temperatures in central Myanmar. “As well as toddy palm trees, the deforestation of other trees also contributes to flooding and rising temperatures. Deforestation can have serious impacts on the ecosystem. Cutting down toddy palm trees can result in drought,” said chairperson of Evergreen Environmental Conservation Association Professor Daw Sein Sein Thein. It is sure that Myanmar traditional snacks made with jaggery and handicrafts made from the branches of toddy palm trees will follow suit if the trees and the jaggery business vanish. “Jaggery production has come down as the number of toddy palm tree climbers has declined. If the government leaders pay attention to this and provide assistance, the business perhaps may develop again. But looking at the current trend, the situation will only get worse,” said ex-toddy palm tree climber U Thaung Myint of Natpalin Village. Though people are selling old toddy palm trees in other parts of central Myanmar, those in the Bagan-Nyaung U locale have decided to keep their hope of seeing the hustle and bustle in their toddy palm fields rise again. “If jaggery prices stay good for a long time, more people will come back to this business, I think. I won’t sell the toddy palm trees on which my ancestors have worked. I will keep them with the hope that the business may thrive again,” said U Kye Ni.